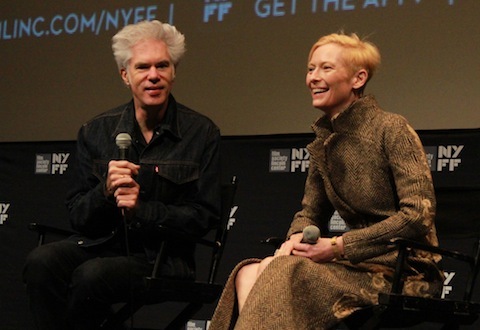 Perhaps it’s no surprise that Jim Jarmusch’s latest movie, Only Lovers Left Alive, is about vampires. With his shock of white hair and all-black wardrobe, he’s a bit of a vampire himself, not seeming to have aged a day in the 30 years since his breakout feature, the deadpan black-and-white comedy Stranger Than Paradise. But he has grown as an artist, as I can testify having attended several screenings in the Film Society of Lincoln Center’s complete Jarmusch retrospective, Permanent Vacation, named after his 1980 debut, a fascinatingly primitive and nearly formless depiction of life in the downtown New York art scene before Manhattan began its transformation into the world’s biggest shopping mall. In order to find an equally scary and uncivilized place, Jarmusch travelled to Detroit to film much of Only Lovers Left Alive, which can only be described as an undeadpan comedy. Convincingly debauched Brits Tom Hiddleston and Tilda Swinton star as Adam and Eve — yes, that Adam and Eve — vampires who’ve kept their love (and themselves) alive for all these years by feasting on blood provided by such sources as 16th century playwright Christopher “Kit” Marlowe (John Hurt), who takes some hilariously pointed shots at his contemporary, Shakespeare, and a research-lab worker known only as Dr. Watson (Jeffrey Wright, who steals both of his scenes). Whether or not you enjoy Jarmusch’s films—and I’ve loved some (the martial-arts masterpiece Ghost Dog: The Way of the Samurai) more than others (the muddy dramedy Broken Flowers), you’ve got to give the guy credit for never selling out. Even when he does genre pieces, he subverts the conventions; witness the abstruse Western Dead Man, or Only Lovers Left Alive‘s final scene, which I won’t spoil. To invoke the title of one of his best films, he boarded the Mystery Train long ago, and he’s not about to hop off now. « Back in the New York Times!